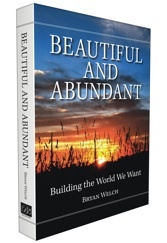 The latest book by Bryan Welch called “Beautiful and Abundant” did not grab me by it’s title, rather a friend recommended it, so I read it as a break from all the technology that I regularly use (yeah big and small things with screens and key pads). So I started reading thinking it was just a story. Well, a story it is and a great resource as well! The 4 steps I found really useful as they can be applied so easily to any task or dream you have. 2) Does It Create Abundance? Such a simple though powerful approach! So hidden behind the title are simple Steps and Questions to make sure your world is beautiful and abundant. I hope you make use of them, I certainly will. assist people experience that sustainability is profitable!